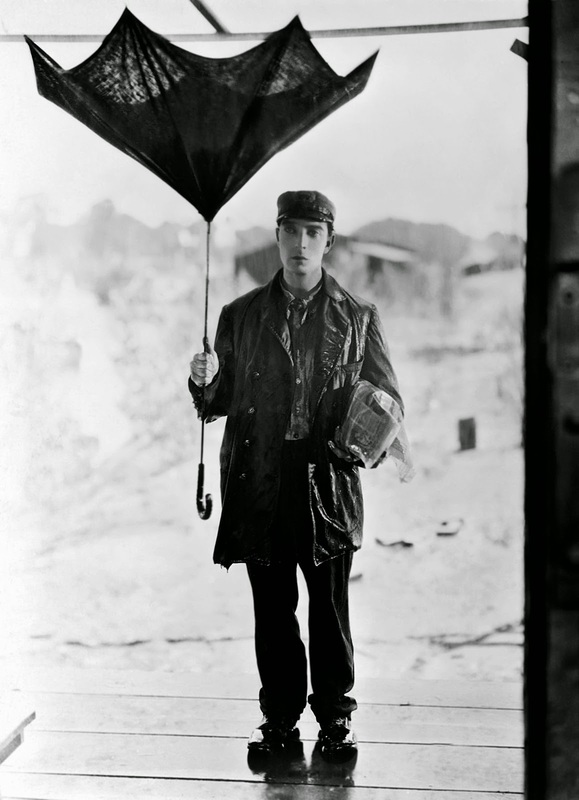 Its true, I've watched a lot of Buster Keaton films before today; but they have all been on my computer or my phone. For years I've heard folks say that there is nothing like seeing one on the big screen. But, alas, that privilege has never presented itself to me before now. But a couple of weeks ago, I was beyond excited to learn that the local artsy movie house would be playing Steamboat Bill Jr. in a free presentation geared toward a family audience. After counting down the days, shifting my calendar around, biting my nails and waiting, the big day was finally here. ...And now I'm here to tell you that ... folks are right! Keaton on the large screen is 100x better than Keaton on the small. And that is saying something! Half the reason is obviously because visual material is that much more exciting on a large frame. (And of course Keaton that much more beautiful under magnification). But truly that is not the best benefit. It is just so much more palpably 'real' an experience to get a ticket, sit in a theater -- with others around you -- and sink into the dark. I felt transported back 86 years and could feel the energy of what moviegoers in 1928 would have felt. The people around you are laughing out loud, sometimes clapping or gasping or reading out title cards. Its not me staring at my 17" laptop, alone, at home, but a crowd of genial, happy families together sharing a moment and appreciating the skill of this great star. And what a movie to do that with! Steamboat Bill Jr. is the height, the absolute apex of charm and probably my all time favorite Keaton film (and one of my favorite films ever. Period.) What makes it so good is the completeness of many elements that come together in the tightest, most enjoyable package imaginable. 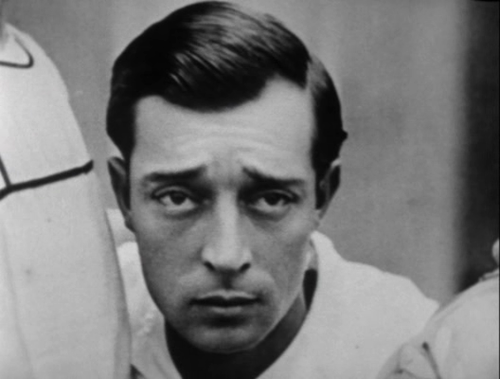 Buster was put on this earth to play the role of Bill Canfield Jr.. He is perfection as the foppishly cute, childishly stubborn, but basically moldable son. He follows dutifully as dad pulls him along by the hand. He gamely lets dad call the shots on mustache- and ukulele- removal, as well as clothing and hair readjustment, but when Bill Jr. runs into his college girlfriend (who unfortunately happens to be his dad's arch-rival's daughter), Buster draws the line. He's not giving up King's daughter (played deliciously by Marion Byron) for anything. And who can blame him; She is the cutest, spunkiest, gamest costar for Buster that I've ever seen. Her talents suit his well and their scenes together are a joy. The father/son pairing is extremely well done and forms the heart of the movie as well as a good deal of lighthearted charming laughs in the middle of the film as they work out how to be together. But (with just an hour to work with) the film swiftly moves away from this upbeat pace and into moments of tension and real conflict stemming from the underlying feud, a misunderstanding between Buster and his girl, and some serious rain. Keaton the director knows just how to pepper this story with insanely physical stunts, keeping the audience hooked and compelled, while Keaton the stuntman knows how to amaze us. Then there is Keaton the actor knowing just how to win us over heart and soul. Seeing it "live" and "big", you can actually hear and feel the audience falling in love. As if all of that weren't enough, the last 10 minutes of the film morph into a sequence of the most jaw-dropping barrage of nonstop stunts I've ever seen. No expense could have been spared during scenes of the town's destruction in a fierce tornado-like storm. And the amazing part is that it is all REAL and made in 1928. The insanity culminates in the famous scene where Keaton allows a house front to fall on top of him, just gliding over him by the slimmest of margins before crashing hard into the ground. From all accounts, this was entirely real -- with a several ton house front and a upper story window designed to give just inches of clearance around our main man. Buster could easily have been killed had anything gone awry. (Seeing that on the big screen by the way, literally gave me chills, though I have seen it a million times before on the small). The funny thing is, no matter what crazy head-spinning, back-bending, house falling shenanigans he gets up to, you feel safe watching Buster Keaton because his clear skill and precision allow you to know that he knew exactly what he was doing. His stunts don't feel scary or reckless, because of his comedic touch and because of the trust the viewer develops for Buster. His physical skill just simply can't be praised enough. The man was a genius. At the end of the film Buster gamely steps up and ends up saving everyone in sight from the throes of the storm and we are treated to one last gag and a feel good experience that is sure to last. What I love about the film, in particular, is not just the great acting and action and charm Keaton always displays, but the overall impression you get here of a man at the height of his career. Though the heroics may not kick in until the end, Keaton's mastery and control are the constant backdrop. Here he plays a rather silly guy, sure, but one who exudes the most amazing calm centered acceptance of life. Though absurd sometimes, Keaton is never stupid. He can feel both like an everyman whom we sympathize with because we identify with AND a superman who can perform feats that most of us can't fathom while just beautifully, zenfully and calmly living in his moment. That Keaton walks this line so deftly is always a miracle to me and makes his films profoundly good for the spirit. Great review. Do you ever plan on returning to this website? It's lovely and I always re-read your stuff every now and then.